UPDATE: Police have arrested Nahom Tsegazab, 19, in connection with a deadly shooting at a Toronto block party. 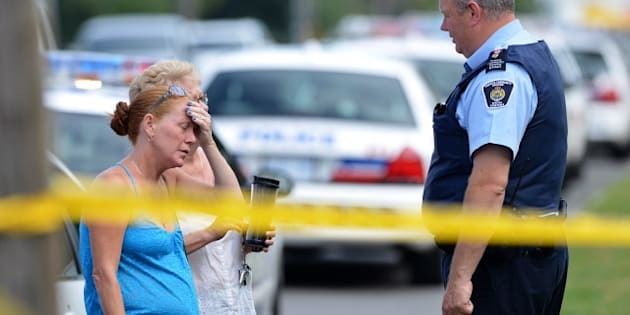 TORONTO -- Toronto police were sending reinforcements Tuesday to a diverse east-end neighbourhood as they vowed to relentlessly root out the gunmen who opened fire at a bustling block party, killing two people and sending scores of others to hospital. About 200 people were at the barbecue party held outside a community housing complex Monday night when gunmen sprayed the crowd with bullets in what police are calling the worst incident of gun violence in the city's recent history. Police said 23 people were sent to hospital with gunshot wounds, including a 22-month-old child who was grazed by a bullet and is in stable condition. One person was trampled in the stampede that followed. Some of the wounded, aged between one and 33 years old, have been treated and released. One male is undergoing surgery and remains in critical condition, police said. Officials identified the two people killed as 14-year-old Shyanne Charles and 23-year-old man Joshua Yasay. Police Chief Bill Blair said police suspect the shooting was gang related. "We believe from information that we have received to date that this altercation involved two individuals and as a result there was an exchange of gunfire,'' Blair said at a news conference. A "significant'' number of officers were deployed to the community Tuesday and Blair said they would remain for several weeks to soothe residents left shaken and fearful by the attack. Blair said police have received "some co-operation'' from witnesses at the scene, and called on all community members who attended the party to help with the investigation. Police also asked for anyone with video or photos of the incident to send them in. "I'm here today to make an appeal through you all, to the many hundreds of people who were present at the event yesterday who may have some information relevant to this investigation to come forward,'' Blair said. "We are very concerned not only with the quick resolution and solving of this crime but the potential for retaliatory violence, which we often see in this type of event,'' Blair said. The incident took place before 11 p.m. on Danzig Street near Morningside Avenue and Lawrence Avenue East. The street was still strewn with empty water bottles and other remnants of the party on Tuesday, as swaths of police tape surrounded the area. Shannon Longshaw said the party, which she helped organize, started as an afternoon barbecue for neighbourhood kids. But even as the crowd grew later in the day, she said the festivities stayed friendly _ until shots suddenly rang out. "There was no fighting, nobody got into an altercation, none of that,'' she said Tuesday morning, after spending much of the night being questioned by officers. Bruce Strachan has lived in the area his whole life, but said he's now thinking of moving away. "This is shocking,'' he said, watching police comb over the scene. Tears shone in one man's eyes as he recalled walking out of a friend's house and into the crowded celebration just moments before violence erupted. "I saw people running, I heard 'crack, crack' and I hit the ground,'' said the man, who did not want to be identified out of concern for his safety. "It was like a Quentin Tarantino movie,'' he said, calling it the most frightening thing he had ever seen in more than four decades in the neighbourhood. Police described the shootout, which involved multiple guns, as an ``unprecedented'' episode of violence. One injured "person of interest'' is in custody, police said. Mayor Rob Ford visited the scene of what he called a ``horrible tragedy'' Tuesday and sought to reassure residents that Toronto remains safe, despite several high-profile shootings in recent weeks. "We've had a couple of isolated incidents ... I know this is the safest city in the world, I've always said that, I truly believe it,'' said Ford. "Everyone has to move on and carry on with their life,'' he added. Federal and provincial officials quickly condemned the violence. Monday night's shooting came just weeks after a gunman opened fire in a crowded food court at Toronto's Eaton Centre. One man was killed instantly, another died of his injuries days later and several bystanders were sent to hospital. In another recent incident, a man was shot in Toronto's east end shortly after the Canada Day fireworks display at the city's waterfront. As well, a man was gunned down at a cafe in Toronto's Little Italy on June 18. And Jane Creba, 15, died after getting caught in the crossfire of a shootout between rival gangs on Yonge Street while it was crowded with Boxing Day shoppers in 2005.